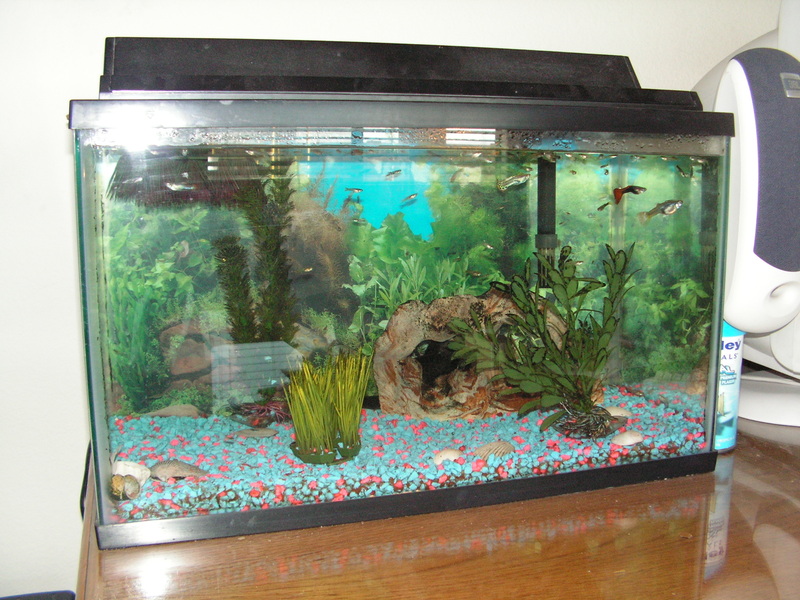 April 2007: Three mature guppies. 37 immature baby guppies. Have you ever wondered how Walmart started? I can tell you all about it. Sam Walton obviously had guppies of mixed sexes in one tank early in his life. Soon Sam had two tanks to deal with the overpopulation crisis. Then ten tanks. Then he had to start Walmart to sell all the guppies. Wisely, his stores now house their guppies in two tanks and separate the fish by gender. You’d think we would have caught on to this. But no. We bought three cute little guppies…. two years ago. The crowd control problem was worse than the thirteen colonies before westward expansion…. manifest destiny… all that good stuff. I emailed friends offering free pets for their children…. twenty per bag. I was saving them $2.49 PER FISH! That’s $49.80, for those who don’t have a calculator handy (like I do.) What a nice friend I am! Only two takers. Solution #2 came in the disguise of Vacation Bible School at our church. They unknowingly aided in my guppy distribution by asking me to teach crafts. I was given a “decorating” budget for the arts and crafts room… heh heh heh. AND the theme was Under the Sea!!! Perfect. I decorated with 6″ glass bowls complete with rocks, water and 5-7 guppies. Then I gave them away every day as long as the kid had parental approval. I got rid of more than 75 fish that week…. but that was over 8 months ago. We are back up to over 100 guppies in our 10 gallon tank. I tell you all of this because I can’t sell them on eBay or Craig’s List. Please help! Free guppies! Leave your contact info in the comment box below and I’ll have them delivered to your front door. This entry was posted on April 1, 2008 at 3:47 am and is filed under Uncategorized. You can follow any responses to this entry through the RSS 2.0 feed. You can leave a response, or trackback from your own site. Okay, I think we have a problem here at the Crosby house. I would say yearly with an over population of guppy inhabitants. There needs to be some intervention here, maybe professional help by Dr. Phil, or even better, maybe re-education of the birds and the bees talk, just maybe? LOL! You crack me up! I know there are certain things that I can count on and one is the yearly spawning of guppies at the Crosby home. Ya’ll just make me smile! Hi, I’d like about 6 or 7 female guppies. I don’t mind if they’re pregnant or not. I’ve actually got the opposite problem, my guppies aren’t breeding!!! However, I’d prefer if I could get them for free or at a cheap price since I’m saving up for some sponge filter in my female bettas’ tanks. I have a few questions before I accept any guppies though. Are the guppies heavily inbred? Because it kind of sounds like it from your post, (no offense) how you started with 3, then two years later you had 250 of them. Renee, This is actually a homeschool fish tank gone wild. We don’t sell them. Yes, you are correct, they are heavily inbred. I’m sure most of them are retarded. This week is VBS at church and my favorite guppy time of the year…. I give them all away. I gave away about 25 this morning. Sorry to disappoint you. I wouldn’t have a clue how to ship guppies from AZ…. they’d be cooked before they left the post office. Update: July 2008… I bought another special “population control” fish at Petco. Now I have only five guppies….. and no babies that live longer than a couple of minutes. It’s the circle of life right in my family room. Makes me want to sing a Lion King song….. The Ciiiiiiiiiiiiir-cle-le-le…. Um… Zac… the blog post was over a year ago and I don’t ship fish anywhere. But thanks for reading! Do you still have free guppies? Oh, goodness, I just read the other comments…oops. I actually live in Minnesota, and read you don’t ship them, I’m sorry! i would but iv got the same problem but iv got about 300 and 3 tanks. 1 20 gallon, 1 30 gallon and 1 5 gallon. im trying to fined a way of geting into the market with them. uv given me some idea’s now so thank you for the inseraton. Do you have any Guppies to get rid of. I have 4 of them now and one picos. they havent started to reproduce yet o I have some room for others..
i have 3 males 3females and 3 babies i would like to have some. Sister’s Jar, I was searching for anything comparable and was grateful to find the advice as a result of this blog post.